Under flyovers, in schools, in offices and any possible government space, farmers are locking up cows and bulls everywhere keeping them away from fields in the crucial rabi season. As government struggles against their burgeoning number, anger is growing, solutions dwindling. The occasional bright shafts of light piercing the pitch-dark farmlands along the Aligarh-Mathura highway can be a little unsettling for the weary traveller. More so on a frosty January night. But Ravinder Singh and Chaman must ignore the cold. The reason is evident seconds later, as a sharp neon beam from Ravinder’s torch bounces off blades of green before falling on a pair of glowing eyes. It immediately sets off a wild chase: armed with a bamboo stick, Ravinder dashes across the field to drive away the lone bull, stomping through his young wheat rabi crop. The animal runs away but Ravinder, 42, suffers a bad fall. It’s not just Ravinder, a farmer in Tehara village of Aligarh’s Iglas tehsil, who is spending most nights in his fields these days. Farmers across western Uttar Pradesh are keeping night vigils, seeking to protect their crops from an alarmingly growing population of stray cattle, which is now haunting this striking kaleidoscope of wheat, potato and mustard farms. Like others in his village, and across rural India, Ravinder is used to retiring early for the night, after a day in the fields starting at dawn. But now, in village after village, farmers are taking turns to guard their crops, well past midnight. After a day’s work, Ravinder is back in his field by 8 pm. For the next four hours, he must ensure the cattle don’t get to his 30 bighas. Then it gets too cold, at a time when temperatures can plummet to 5 degrees Celsius in the plains of North India out at night. On the other end of the field is Chaman, his beedi glowing in the dark like an ember. Ravinder flashes the torch towards him, signalling that the latter can leave. Chaman, 38, who is paid around Rs 100 each by farmers for the vigil, sets off for a neighbouring farm. Meanwhile, Mor Mukat (65) and Babloo (25) Baghel, a father-son duo, spot Ravinder from a distance and greet him. The two plan to spend the entire night at a temporary shelter near their farm, where the threshing machine and other equipment are kept. “Even barbed wires are not enough. The animals damage the poles on which the fences stand. Moreover, there are wild pigs, which can be quite ferocious. Young people are also bringing their bikes to the farms, making use of the headlights during vigils,” Babloo says. The farmers say the situation has come to this pass since the Yogi Adityanath-led BJP government’s crackdown on illegal slaughterhouses across the state starting March 22, 2017, coupled with the fear spread by self-styled ‘gau rakshaks’. So cattle that are no longer of any use to their owners are being abandoned. There are few takers even for transporting buffaloes, over whose slaughter there is no restriction. “It’s barely been a year since the ban (on the slaughterhouses) and the situation is already getting out of hand. Today, we managed to chase the cattle away. But the day is not far when they will be immune to the fear of sticks. In any case, bulls do injure humans, sometimes fatally. Ab kya hum bandook uthayen (So do we take up guns now)?” asks Ravinder. As tempers rise, in a region that is already a hotbed of caste and communal conflicts, authorities are wary of potential law and order crises. And there have been instances. Tension gripped Iglas town in the last week of December after locals found over a dozen cows buried under sand near Tikapur village, and rumour spread that they had been buried alive. Police sent a few carcasses for post-mortem and later buried them at the same spot. But soon, dogs started digging up their flesh and bones. Last week, the Uttar Pradesh government announced that a 0.5 per cent cow welfare cess will be imposed on excise items to fund shelters for cattle. Even as that order has drawn criticism from many quarters, Chief Minister Adityanath also directed district magistrates to ensure that all stray cattle are put in shelters by January 10. Even officials admit in private that the order is likely to remain on paper. Along Aligarh, Agra, Bulandshahr, Hathras and Mathura that The Sunday Express travelled through, a distance of 386 km, there were hundreds of villages with no gaushalas at all. According to the website of the state Animal Husbandry Department, UP has 510 registered cow shelters currently. Animal Husbandry Minister S P Singh Baghel says more cowsheds will be developed in every district, with Rs 1.20 crore earmarked for each, and that sites for cowsheds, meant to accommodate at least 1,000 cattle each, have been finalised in 50 districts already. Incidentally, the Gau Seva Aayog that monitors the conservation of stray cattle in the state has been headless for over six months, while the tenure of its three members ended in September 2018, rendering it practically inactive. In districts that The Sunday Express visited, Hathras currently has two cowsheds and approximately 7,750 strays (with a fresh livestock census on), and Aligarh 17 cowsheds. The Agra Chief Veterinary Officer’s office said the district has nine cow shelters, and at last count, 991 livestock. Officials in all three districts, who refuse to come on record, say they are planning to set up new cow shelters — “400 temporary ones to accommodate 8,000 animals” in Hathras, “45 cow sheds to accommodate more than 9,000 cattle” in Aligarh, and “23 new cow sheds to accommodate 8,500 cattle in Agra”. However, it’s not clear how quickly or where these shelters/sheds will come up. In Hathras, there are plans for “purely temporary cowsheds through panchayat and public contribution”, while Agra officials are hoping to rope in everyone from the Animal Husbandry Department to Nagar Nigam, zila panchayat and social workers for help. Aligarh has ambitious plans, of 17 “pashu charagrah (cowsheds)” by the January 10 deadline, as well as development of Govansh Abhyaranya (cow sanctuaries) on 47 hectares and a Vrahad Go Sanrakshan Kendra (mega cow shelter) over 4.5 hectares. Hathras DM Rama Shankar Maurya says the administration has also directed village pradhans to construct cowsheds while Aligarh DM Chandra Bhushan Singh has “urged” police officers and other administrative staff to “adopt” bovines. On the ground, all existing cow shelters, as well as temporary ones, are filled to the brim. One such temporary shelter, already housing over 2,500 cows, in Hathras district saw villagers clash with authorities last week to get the 20 stray cattle herded by them in. Turned away from the makeshift shelter, the villagers threatened to lock up the cattle in the local tehsil office. In Aligarh, Mathura and Agra, villagers actually herded stray cattle into primary schools and government offices and locked them up in the last week of December. The authorities have managed to clear the schools, but all other available government land, including complexes housing water tanks, now has abandoned cattle locked in. 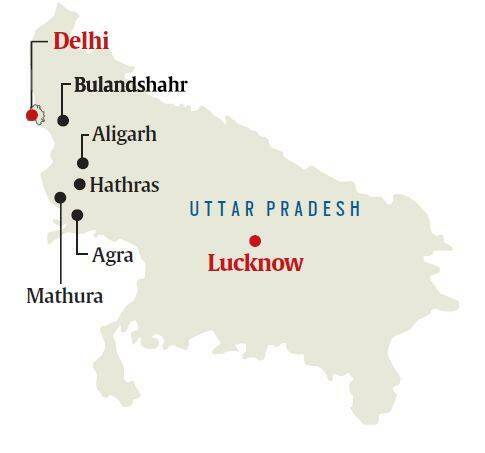 Abutting the site of a proposed super thermal power plant in Bulandshahr’s Khurja being built by the THDC — a joint venture of the Centre and Uttar Pradesh government — is Uncha Gaon. Villagers here say they are struggling to not just contain the havoc caused by cattle but also nilgai. “I have grown up here. Stray cattle have grown alarmingly in the last two years. Save for a mini-dairy in the neighbouring Araniya village, there is no cowshed in the area,” says Sandeep Kumar, a 28-year-old Thakur. In Araniya, Samar Singh, 35, says if he skips a visit to his farm even for a day, entire crop will be destroyed. “It is 11 am now and I have made at least eight rounds to my field since 3 am. The problem of nilgai is not new but we have to understand that the damage caused by cows and bulls is much more as they spend a considerable amount of time in one area. Nilgais tend to be on the run,” he says. Seated beside him, Ajeet Singh says the cultivation of maize and arhar pulses has completely stopped in the belt due to the stray menace. Edal Singh, from Khandauli in Agra, laments that the damage caused by even a lone bull can go up to Rs 500. “Ek toh lagat nahi mil rahi, uspar kharche badhte jaa rahe hain (First, we are not getting enough for what we grow. On top of it, our expenses are increasing),” he adds. Asked about the problem, BJP leader Vijendra Singh, the MLA of Khurja (SC) constituency, told The Sunday Express he was not aware of any such reports of damage. “We are looking for land to construct new cowsheds,” he adds. The changing demographics of villages with youth migrating to cities in search of jobs has also made the situation more dire, with the elderly struggling to run the farms while keeping vigil day and night, explains Abhishek Gaur, 18, who is in Class 12 commerce stream. Fencing anyway is costly business. One kilogram of metallic wire costs up to Rs 70, and farmers spend thousands ringing a farm. In Hathras district’s Bisana village, farmer Roop Singh, aged over 80, spends the entire day under a peepal tree to guard his mustard farm. In the neighbouring field, a group of bulls and a few cows can be seen munching their way through the mustard crop. Rambir Singh Pradhan, who owns a dhaba along the Aligarh-Mathura road, recalls the period when people used to worship cows that gave birth to bulls, as they were an intrinsic part of the village economy in the absence of mechanisation and tractors. However, he points out, it is not the case now, minimising the use of both cows once they stop giving milk and bulls. “Katni chahiye, par Hindu hone ke naate hum ye bol bhi nahin sakte (Cattle should be slaughtered, but being Hindus, we can’t even say that). Even politicians know the reality but stay mum. We worship cows but the rules should be flexible. Now it is clear that the cows are worse off. They are being herded into congested shelters and left to die. How many politicians shedding tears for cows keep them at their bungalows? Be it (Narendra) Modi or Yogi or the gau rakshaks, it is us farmers who are suffering,” Pradhan says, agitated. Towards the end of December, 60 stray cattle kept in a makeshift shed died of “cold and weakness” over a week in Tappal area of Aligarh district. Police had transported 1,800 cattle to a cow shelter at Jarkari town, but the owner shifted most of the animals to the makeshift shed under a highway on the Yamuna Expressway as he had no space left. In Mathura, two days after unidentified residents of a village locked up stray cattle in four government schools, the district administration found four dead on December 31. They set the rest free. The district’s Chief Veterinary Officer, Dr Bhuvdev Singh, said the deaths occurred “due to asphyxia”. Meanwhile, the meat industry in the region is almost dead. In Bulandshahr’s Chaudera town, a cluster of meat shops, which used to sell buffalo meat, have downed shutters in the last one year. Mohammad Sharfaraz, whose shop is one of the remaining two, says the crackdown on local “kattikhanas (slaughterhouses)” has led to a rise in the cost of running the business, as they now have to send buffaloes to the government-notified Hind Agro Industries Ltd in. “Sending and getting the meat pieces back costs us around Rs 2,500 to Rs 3,000. On top of that, there are random raids to check if we are selling cow meat. Everything is running on the whims of a handful of officials. Many amongst us have turned to businesses like tailoring,” Sharfaraz says. However, Sukhbir Singh, a Jat farmer in Agra’s Khandauli, warns their patience is running thin. “Our entire belt voted for Yogi, but not for this. We are all for cow protection but why did he not make arrangements before imposing such measures? Yogiji camera ke saamne gud khilate hain ek gau ko, toh kya poore pradesh ki gau ka pet bhar jayega us se (Yogiji feeds jaggery to a cow in front of cameras. Will that fill the stomach of cows across the state)?” he says. Rs 25,000 to put up fences around my land. There are around 3,000 cattle inside the dairy. Will you put in more to die? There is not enough food and water. Prashashan ke liye aagey bahot kathinaiya hain (The days ahead are going to be tough for the administration),” says Head Constable Raj Kumar of Sasni police station.